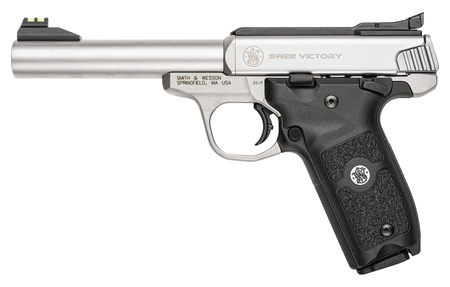 S&W Model SW22 Victory 22LR 5.5 Inch Stainless Steel Frame Stainless Steel Finish 10 Round. Adjustable fiber optic sights. Interchangeable barrel for accuracy. One-screw takedown. Two 10- round magazines. Stainless steel frame. Additional picatinny-style rail used for mounting optics or other equipment.